U.S. Citizenship and Immigration Services Director L. Francis Cissna says his agency is hiring several dozen lawyers and immigration officers to review cases. 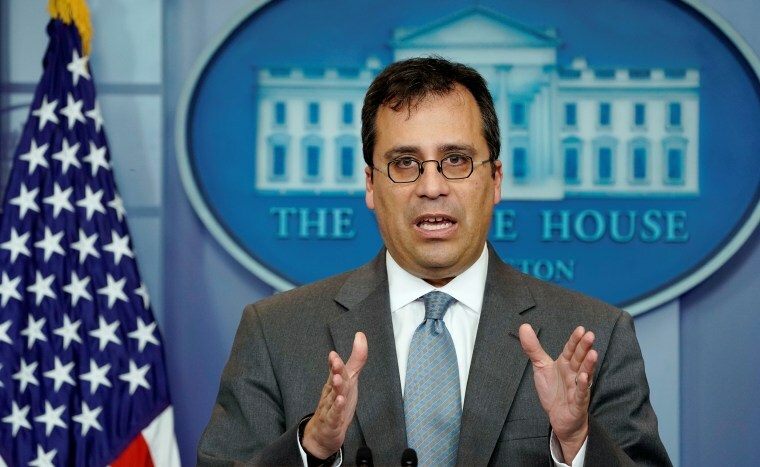 LOS ANGELES — The U.S. government agency that oversees immigration applications is launching an office that will focus on identifying Americans who are suspected of cheating to get their citizenship and seek to strip them of it. Cissna said the cases would be referred to the Department of Justice, whose attorneys could then seek to remove the immigrants' citizenship in civil court proceedings. In some cases, government attorneys could bring criminal charges related to fraud. Until now, the agency has pursued cases as they arose but not through a coordinated effort, Cissna said. He said he hopes the agency's new office in Los Angeles will be running by next year but added that investigating and referring cases for prosecution will likely take longer. "We finally have a process in place to get to the bottom of all these bad cases and start denaturalizing people who should not have been naturalized in the first place," Cissna said. "What we're looking at, when you boil it all down, is potentially a few thousand cases." He declined to say how much the effort would cost but said it would be covered by the agency's existing budget, which is funded by immigration application fees. The push comes as the Trump administration has been cracking down on illegal immigration and taking steps to reduce legal immigration to the U.S. Immigrants who become U.S. citizens can vote, serve on juries and obtain security clearance. Denaturalization — the process of removing that citizenship — is very rare. The U.S. government began looking at potentially fraudulent naturalization cases a decade ago when a border officer detected about 200 people had used different identities to get green cards and citizenship after they were previously issued deportation orders. In September 2016, an internal watchdog reported that 315,000 old fingerprint records for immigrants who had been deported or had criminal convictions had not been uploaded to a Department of Homeland Security database that is used to check immigrants' identities. The same report found more than 800 immigrants had been ordered deported under one identity but became U.S. citizens under another. Since then, the government has been uploading these older fingerprint records dating back to the 1990s and investigators have been evaluating cases for denaturalization. Earlier this year, a judge revoked the citizenship of an Indian-born New Jersey man named Baljinder Singh after federal authorities accused him of using an alias to avoid deportation. Authorities said Singh used a different name when he arrived in the United States in 1991. He was ordered deported the next year and a month later applied for asylum using the name Baljinder Singh before marrying an American, getting a green card and naturalizing. Authorities said Singh did not mention his earlier deportation order when he applied for citizenship. For many years, most U.S. efforts to strip immigrants of their citizenship focused largely on suspected war criminals who lied on their immigration paperwork, most notably former Nazis. Toward the end of the Obama administration, officials began reviewing cases stemming from the fingerprints probe but prioritized those of naturalized citizens who had obtained security clearances, for example, to work at the Transportation Security Administration, said Muzaffar Chishti, director of the Migration Policy Institute's office at New York University law school. The Trump administration has made these investigations a bigger priority, he said. He said he expects cases will focus on deliberate fraud but some naturalized Americans may feel uneasy with the change. "It is clearly true that we have entered a new chapter when a much larger number of people could feel vulnerable that their naturalization could be reopened," Chishti said. Since 1990, the Department of Justice has filed 305 civil denaturalization cases, according to statistics obtained by an immigration attorney in Kansas who has defended immigrants in these cases. The attorney, Matthew Hoppock, agrees that deportees who lied to get citizenship should face consequences but worries other immigrants who might have made mistakes on their paperwork could get targeted and might not have the money to fight back in court. Cissna said there are valid reasons why immigrants might be listed under multiple names, noting many Latin American immigrants have more than one surname. He said the U.S. government is not interested in that kind of minor discrepancy but wants to target people who deliberately changed their identities to dupe officials into granting immigration benefits. "The people who are going to be targeted by this — they know full well who they are because they were ordered removed under a different identity and they intentionally lied about it when they applied for citizenship later on," Cissna said. "It may be some time before we get to their case, but we'll get to them."